Zebrafish have proven to be a valuable model to study human cancer biology with the ultimate aim of developing new therapies. Danio rerio are amenable to in vivo imaging, high-throughput drug screening, mutagenesis, and transgenesis, and they share histological and genetic similarities with Homo sapiens. 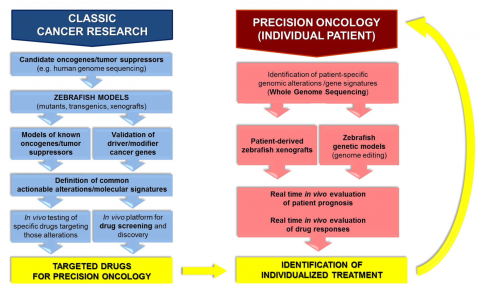 The significance of zebrafish in the field of precision oncology is rapidly emerging. Indeed, modeling cancer in zebrafish has already been used to identify tumor biomarkers, define therapeutic targets and provide an in vivo platform for drug discovery. New zebrafish studies are starting to pave the way to direct individualized clinical applications. Patient-derived cancer cell xenograft models have demonstrated the feasibility of using zebrafish as a real-time avatar of prognosis and drug response to identify the most ideal therapy for an individual patient. Genetic cancer modeling in zebrafish, now facilitated by rapidly evolving genome editing techniques, represents another innovative approach to recapitulate human oncogenesis and develop individualized treatments. Utilizing zebrafish to design customizable precision therapies will improve the clinical outcome of patients afflicted with cancer.